When I started this blog, I decided to steer clear of most food controversies. I try to eat whole foods that are sourced from responsible producers in the USA or other countries with high food standards. I choose organic, where possible. I also will look for pastured, grass fed or wild caught meats. I avoid GMO foods and don’t eat processed soy. Notice that I don’t say “never”. I can’t. If I eat out, I violate at least one of these tenets. I can’t have a diet that is primarily carbohydrates, because I am prone to diabetes. Also, I will gain a ton of weight on such a diet, regardless of whether the carbs are “whole” or not. My diet is mostly protein, vegetables and fruits. I don’t cut carbs out altogether, just don’t make it the focus of any meals. Which brings me to Einkorn Flour. Apparently, over thousands of years, humans have been selectively breeding wheat to grow better with good disease resistance. Sounds great, right? Well, this selective breeding is now being examined in light of a sharp increase in people with gluten sensitivities. Some people are trying to bring back “ancient grains” like Einkorn, Spelt, and Kamut to find a flour product that will be less harmful and more healthful. Einkorn contains gluten and is not recommended for people with Celiac Disease. Let me state that upfront. All wheat contains gluten, there’s no escaping it. What I can say is that using Einkorn did not lead to blood sugar surges that are as bad as using just plain ol’ flour. Also, it tasted better and, rather shockingly, I felt fuller faster. Normally, if I’m splurging on a wheat product, I want to eat a bunch of it. One cookie? Nope. One pancake? Nope. Can’t each just one. Here, I made pancakes and was quite happy to push away from the table. So were the kids. 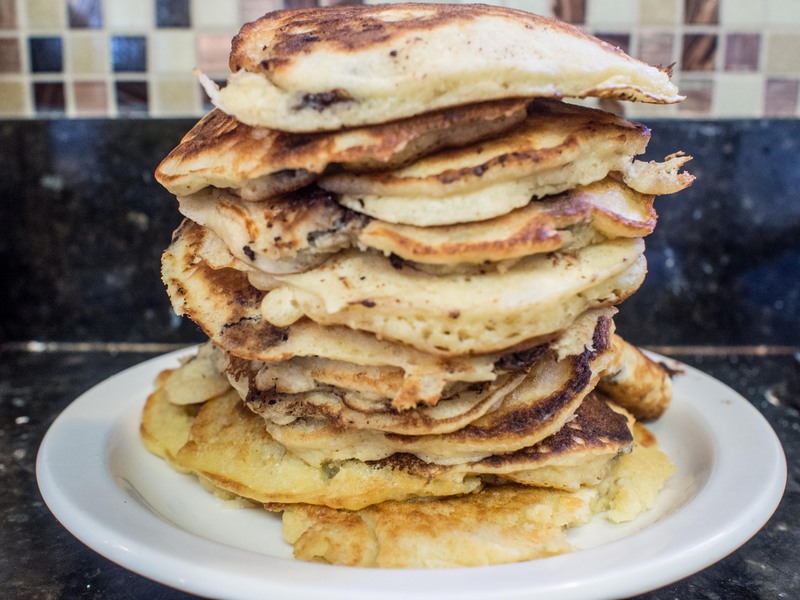 We actually ate less than our usual haul of weekend pancakes. It has a more hearty taste, but is actually has a taste and it’s good. Unlike the other flour that’s more of a building block instead of a taste determiner. Does this mean I’m eating a bunch more carbs? No. But a splurge once in a while with this isn’t terrible. If you google “einkorn flour”, you’ll find claims that it’s more nutritious and better for you than regular flour. You’ll also see where people believe that all wheat is evil and should be avoided, ancient or not. I pass no judgment on these claims. I’m not a food scientist. But I can tell you that if you are interested in trying Einkorn, it behaves very much like regular flour. You may need a bit more liquid, but it was brilliant for our morning pancakes. So much so, that I bought more! 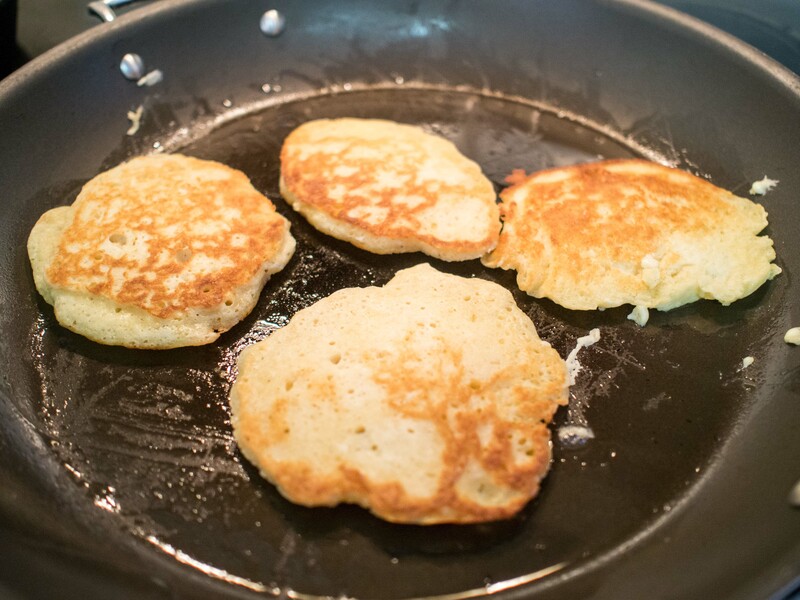 For this recipe, I used James Beard’s recipe for “Basic Griddle Cakes” as a base. I choose this recipe because Einkorn was rumored to lean towards a denser final product and Beard uses a whopping 4 teaspoons of baking powder in his 2 cups of flour recipe. These pancakes were very light and airy and could in no way be described as dense. Combing the first four ingredients in a large mixing bowl and whisk together well. In a smaller bowl, whisk together the liquid ingredients. Add the liquid ingredients to the dry ingredients. 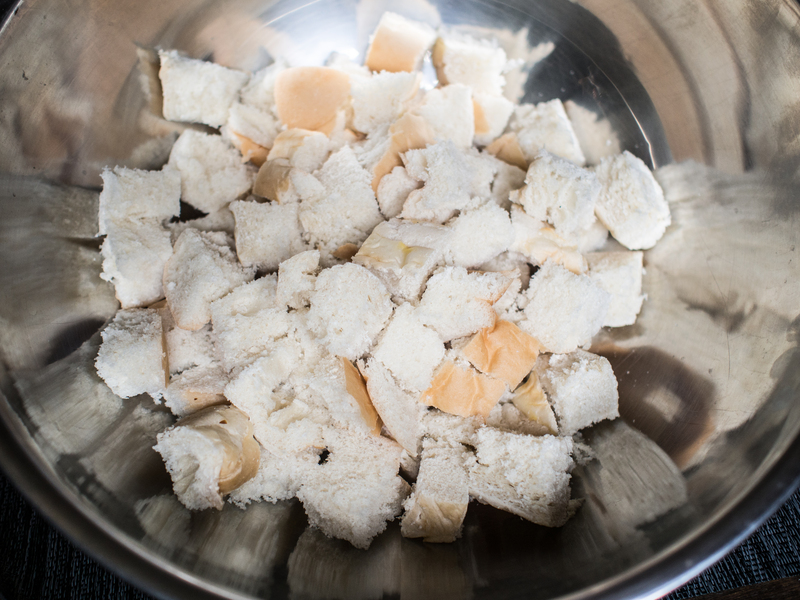 Stir gently until most of the larger lumps are dissolved and the dry ingredients are completely wet. Gently stir in the chocolate chips. If the mixture is too “dry”, add a bit more milk to loosen it up. 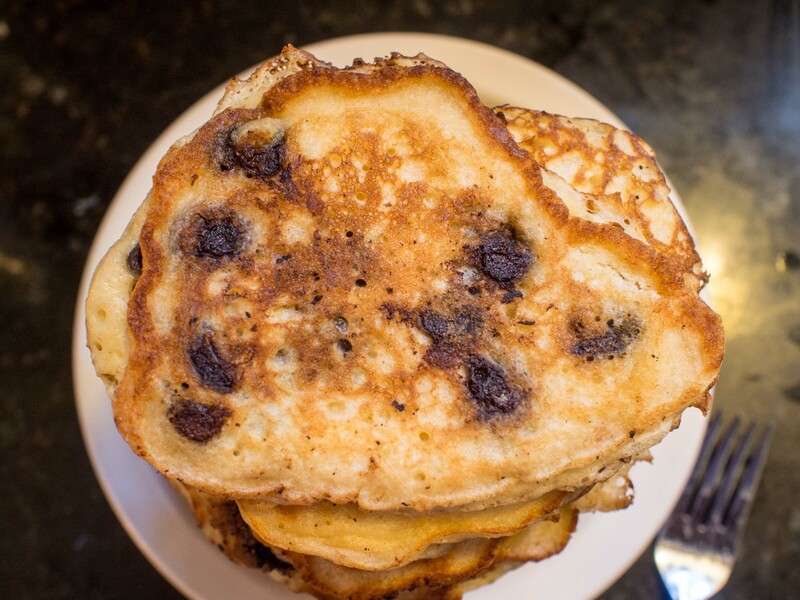 Pour the batter onto a hot, lightly greased griddle or large pan. Turn the pancakes over when bubbles form and the edges appear dry. Turn and cook until the other side is lightly browned. 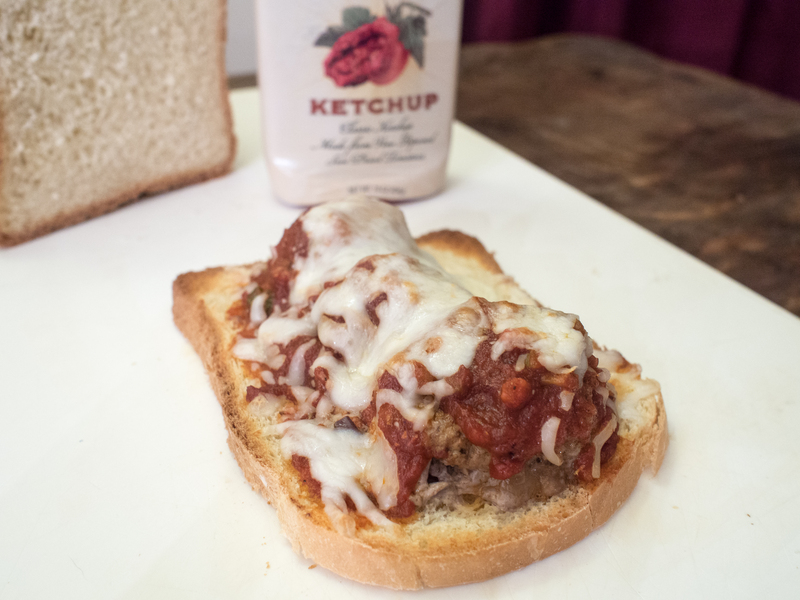 Serve with your favorite accompaniment. This entry was posted in Uncategorized on March 24, 2014 by dawn of food. One year. My little blog is one year old! Hard to believe. So, for my one year anniversary, I decided to write a blog about my secret most favorite obsession. I have never confessed this to anyone, but my favorite cookie, bar none (Ha! 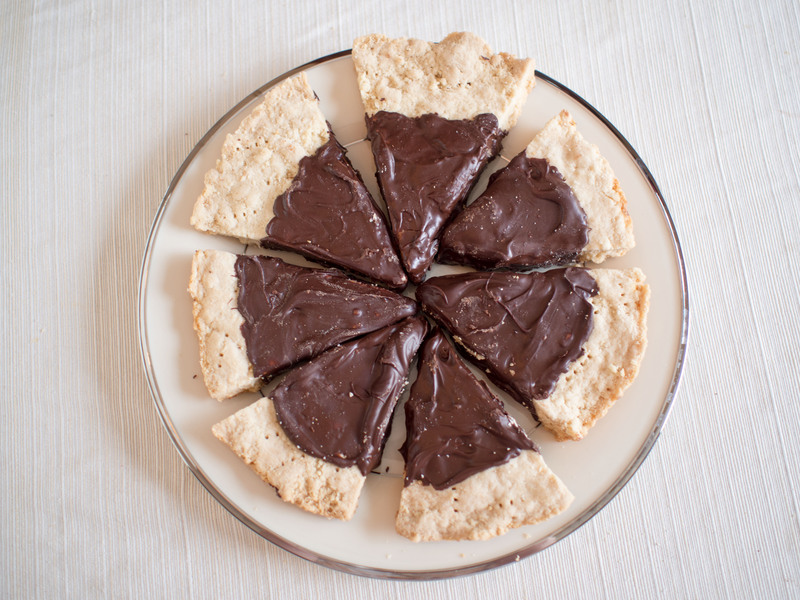 I see what I did there…), is shortbread. Delightfully simple. Crumbly, buttery, and just simply fantastic. I tried Walker’s Scottish Shortbread years ago and was simply enchanted, despite the fact that it lacked my most favorite ingredient: Chocolate. Shortbread, said to be the favorite cookie of Mary, Queen of Scots, first appeared in cookbooks in 1736. Interestingly, it started as a yeast recipe. But the mid-1800s, it morphed into the more modern familiar butter-flour-sugar based recipe. Finding a recipe was rather easy, but there seems to be a bit of a divide. 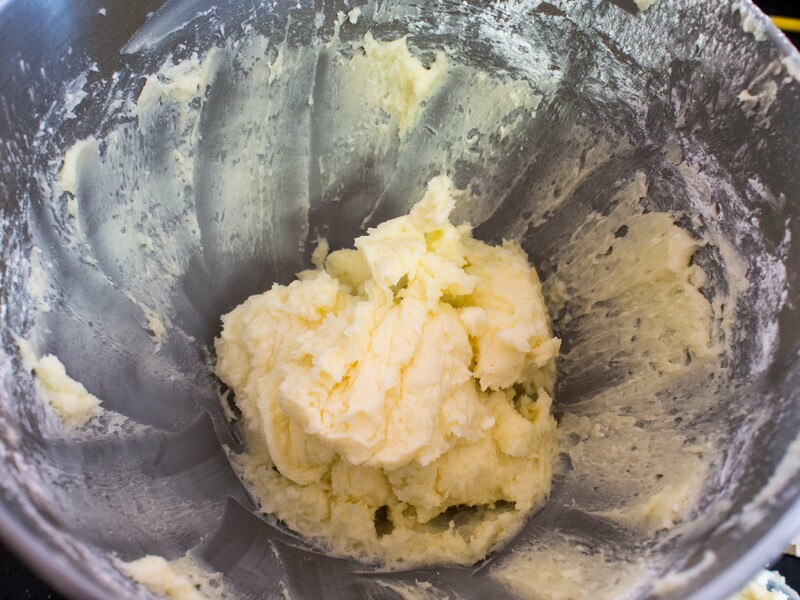 Some recipes are very purist: flour, sugar, and butter. But there is some discussion about adding either cornstarch or rice starch to the mix. The recipe I used called for confectioner’s sugar, which is essentially sugar mixed with cornstarch. 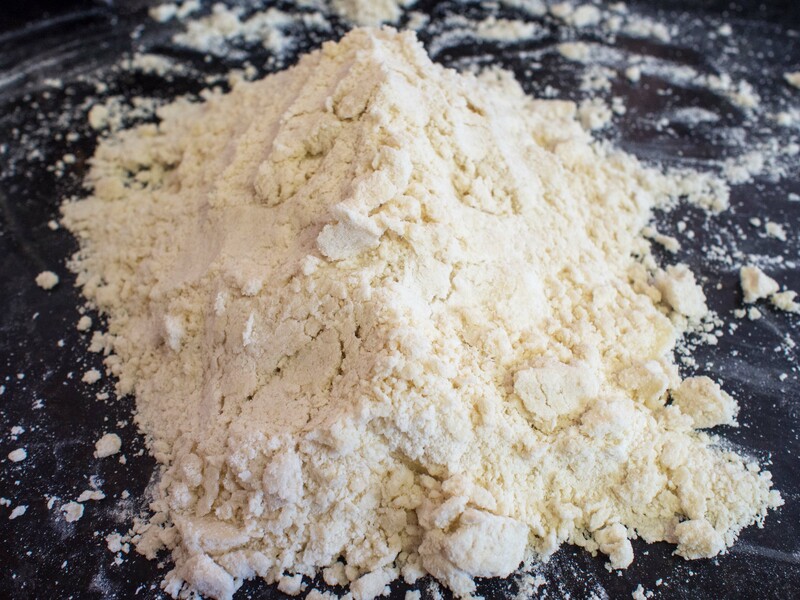 Why cornstarch or rice starch or rice flour? These items contribute bulk without toughness because there is no protein or gluten. Fun fact I learned making these cookies! “Short” in baking vernacular is not a description of the size of final product, but that something was used to shorten the gluten strands that form when you use flour. So, shortbread will be a crumbly cookie, because it lacks long strands of gluten. The butter playing the part of “shortening” the gluten strands. I added the chocolate not for my own amusement, but my daughter thought the cookies would be better with chocolate. I did not, I thought they were perfect plain. Of course, she won out! I found the recipe in James Beard’s American Cookery and added the chocolate! Cream the butter until almost like whipped cream. Gradually cream in the sugar and continue beating until very light. 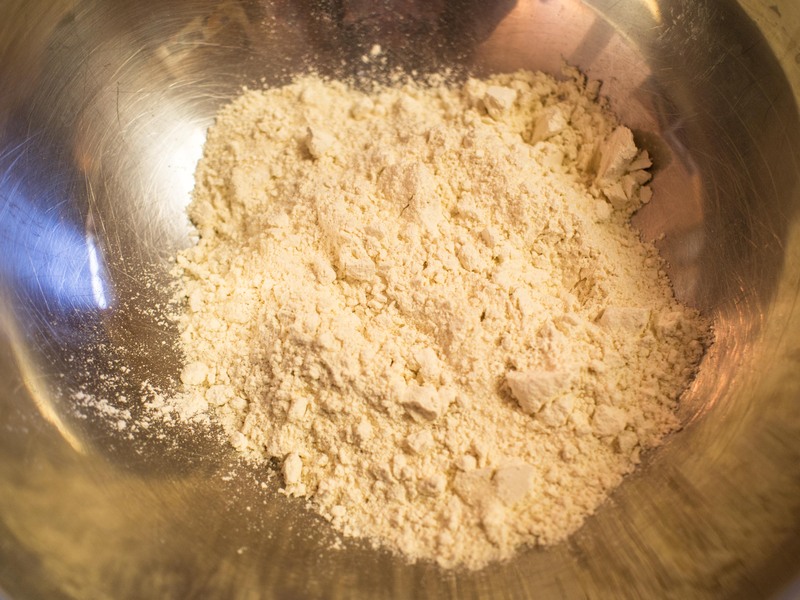 Stir in the flour, then turn the mixture out onto a lightly floured board or counter and knead the mixture until it is very smooth and will break slightly when the thumb is run from the center to the edge of the ball of dough. You can still kind of knead it and see that it does change consistency after several minutes. I seriously wasn’t expecting it to be a pile of sand. Now, if you omit the confectioner’s sugar and just use regular sugar, I doubt your dough would look like this. Traditionally, this dough is pressed into shallow pie pans, the dough being about a 1/2 inch thick. 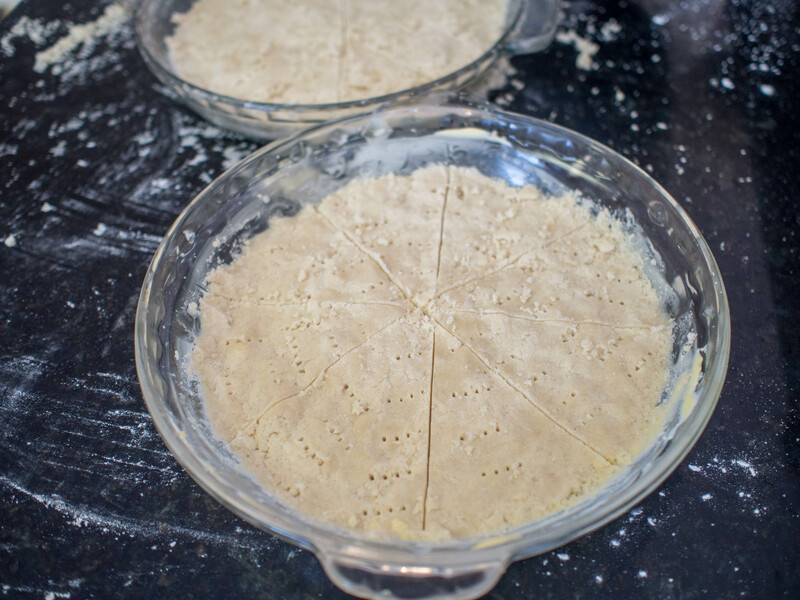 The edges are fluted as on a pie crust, and the serving portions are stippled across the dough with a fork so that the shortbread can be broken easily into small pieces. Prick the dough with a fork in even the smallest pans, or it is apt to blister in the enter. Bake in a 275-300 degree oven until the dough turns a pale brown around the edges. Time of baking depends on size of pan and thickness of the dough. Remove from the pan, cool on a rack, and store in an airtight container. For the chocolate dipping sauce: place chocolate and butter in a microwave safe bowl. Using 50% power, in small bursts of time, microwave the chocolate and butter until just melted through. I do this in 2 minute increments and stir between times. Slather on cookies, let dry. This entry was posted in Cookies, Dessert and tagged Chocolate, Cookie, easy, scottish, shortbread on March 17, 2014 by dawn of food. There are lots of people who claim not to be able to bake. This dessert is so simple, anyone can make it. Honest. 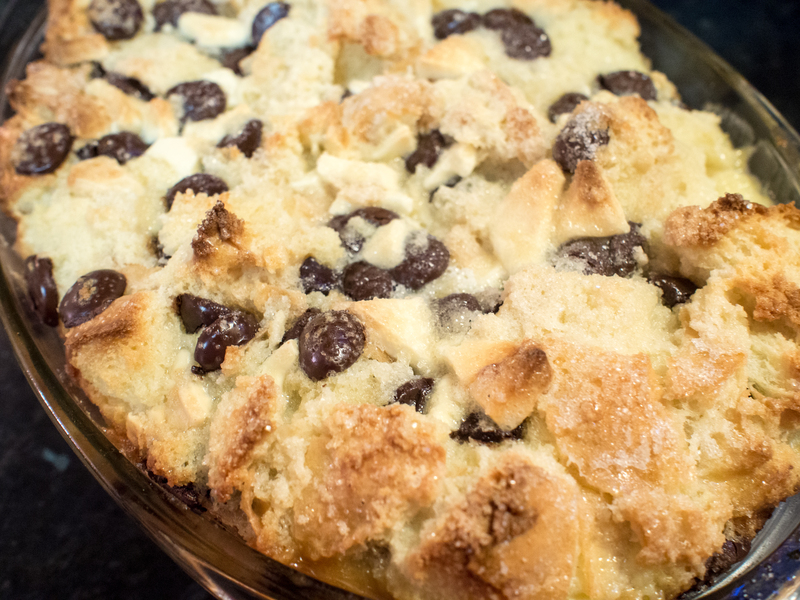 If you have never made dessert before because you don’t think you can bake, bread puddings can be your “thing”. It is E.A.S.Y. Not “easy as pie” easy, because those aren’t. Like crazy easy. So easy, my children (both under 12 years old) have made it. 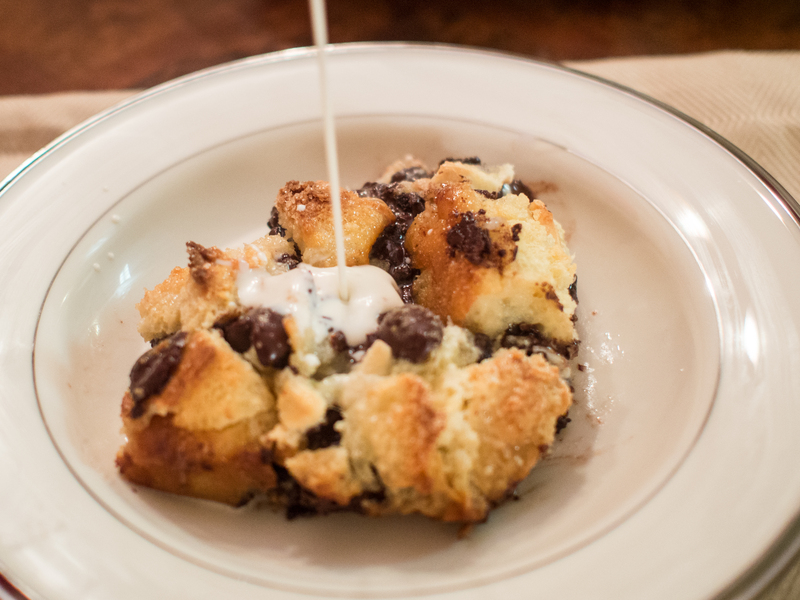 Why is bread pudding so simple? Someone else has done the work! Specifically, whoever made the bread. You are just adding some milk and cream, sugar, and eggs, at the basic level. 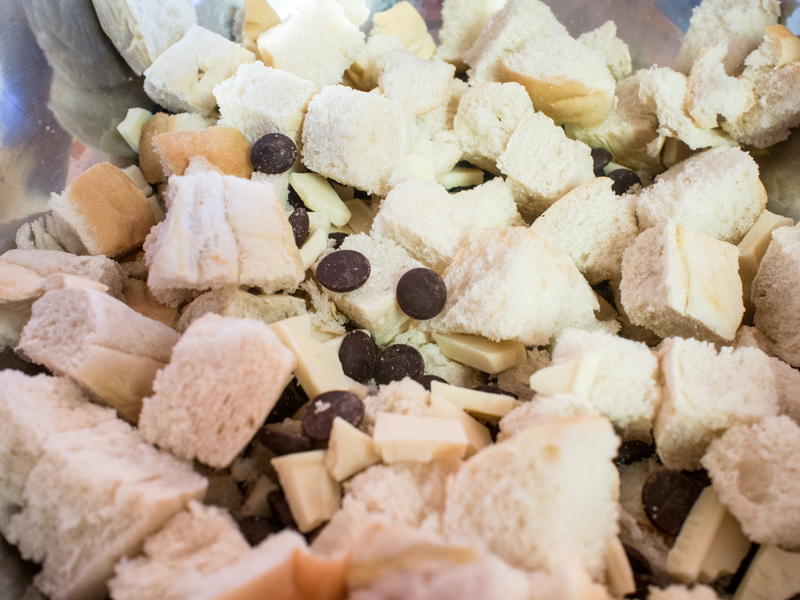 If you can cut bread into squares and mix together a few ingredients, you can make a spectacular dessert. And, unless they read this blog, no one will know how easy it is. This dessert is my Christmas Eve dessert. It serves a large crowd and requires little prep time or mess. It can be an Irish dessert for St. Patrick’s Day if you flavor it with Bailey’s. It can really be a great dessert for any occasion. The sauce can be made ahead and kept in the refrigerator. The recipe below is inspired by this recipe at epicurious.com. In a heavy saucepan, bring the first four ingredients to a slow boil over medium heat, stirring frequently. In a small cup, mix together the cornstarch and water well. 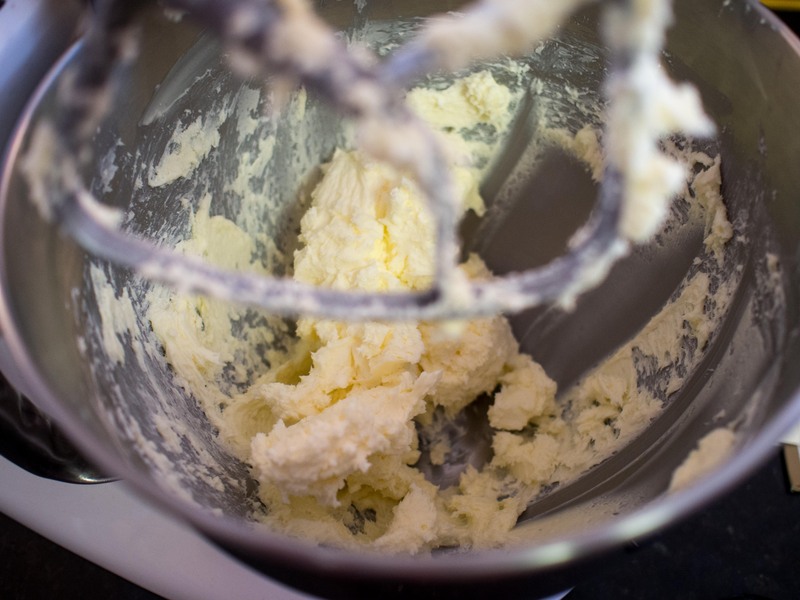 Whisk into the cream mixture. Stir constantly until the mixture slightly thickens. About 3-5 minutes. Remove from heat and cool. Cover and refrigerate. Can be made up to 2 days ahead of time. 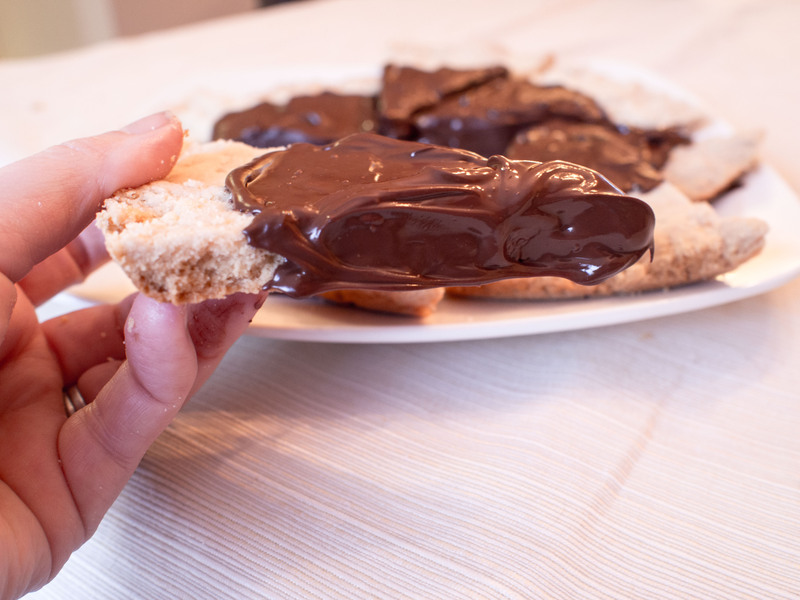 Stir together the bread and chocolates in a large mixing bowl, set aside. In a medium mixing bowl, whisk together the eggs, 1/2 cup and 2 tablespoons of the sugar, vanilla, 1 1/2 cups of cream and the milk. Add the cream mixture to the bread mixture and soak for about 30 minutes. While the bread is soaking, preheat the oven to 350 degrees Fahrenheit. Grease a 13x9x2 baking pan (or any similarly sized vessel). If during the soaking, you notice that the bread is dry-ish and there’s no more liquid in the bowl, add some additional milk or cream. You want your bread to be rather moist, not dry. 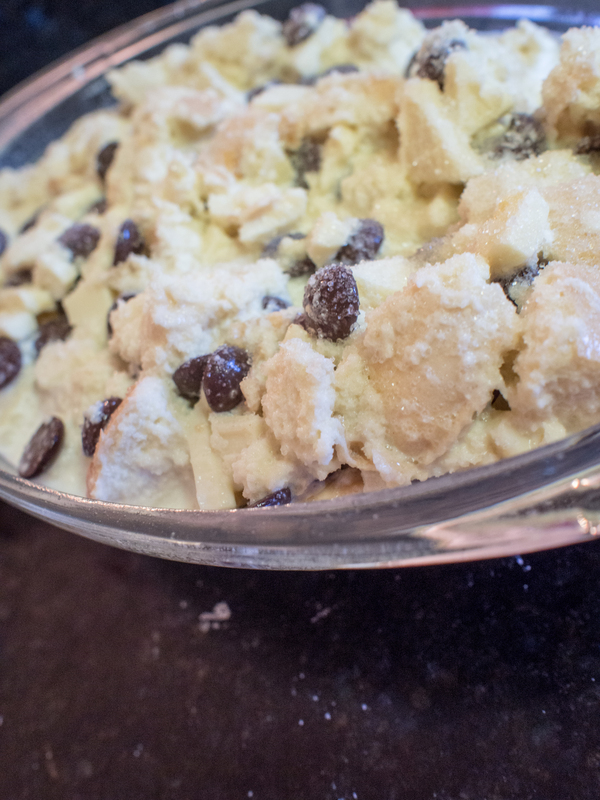 Add the bread and cream mixture to the baking pan. Add the remaining 1/2 cup of cream to the pan, distributing the cream evenly. Sprinkle the top of the pudding evenly with the two tablespoons of sugar. Bake for about 60 minutes, or until the edges of the pudding are golden and the mixture is set in the center. For me, usually between 50-60 minutes. Top with the cream mixture and serve. This entry was posted in Dessert and tagged bread pudding, dessert, easy bread pudding, easy dessert, Irish Cream, New Orleans on March 3, 2014 by dawn of food. I went to graduate school in New Orleans. New Orleans blew my mind, food wise. For one of our first food adventures, my mom and I ate at Paul Prudhomme’s K-Paul’s in the French Quarter. All of the food was so lovely! I looked at the menu and Chicken Big Mamou stood out as something I wanted to try, but I’m not a spicy food person. The menu warned that it was a very spicy dish. My mother scoffed and said that this is a restaurant, they’ll moderate it and make it so that everyone can eat it. I fell for it and ordered it. For me, it was inedible. Beyond spicy. Torture level hot. I couldn’t tell you what it tasted like because it just felt like molten lava in my mouth. My mom traded with me (thanks mom!) and ate it because she loves food spicy. It was hot for her, but she loved it. We bought the cookbook and made it at home. Others had to appreciate how hot a dish can be!! The men in the house ate it, but it looked like they were having a heart attack: red faced, pouring sweat and clearly uncomfortable. So, why make it? Well, one it’s Mardi Gras season. I didn’t want to do a shrimp creole or crawfish etouffee. Two, my husband and son love spicy food. They make their own hot sauce! So, back to my enemy. I looked at the recipe. My goodness, what a fussy recipe! Lots and lots of ingredients, and butter. Lots of steps. Ugh. So, I googled it. Prudhomme had changed the recipe!! Wrap your head around that. The recipe on his website is 1/10th the fussiness of the one in his fantastic cookbook. But in reviewing it, I was about to make it a lot less fussier. This has now become an easy (and cheap!) 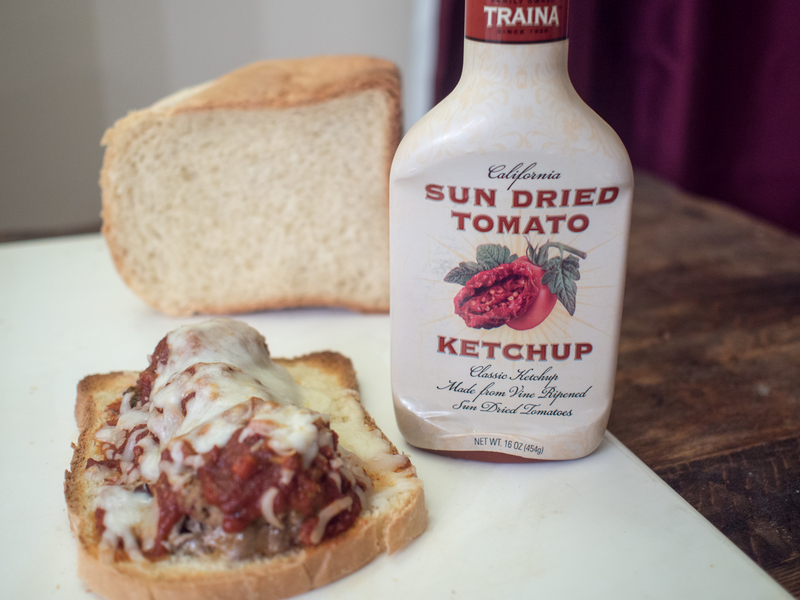 weeknight meal that anyone can add into the rotation. Don’t misunderstand what I’m going to say here, but while I love Prudhomme, his recipes are maddening. Extra steps that don’t seem to add much turn homey recipes into complicated, time consuming affairs. The spice lists alone are daunting. I never got the sense that people in the bayou would cook this way. Maybe they did and I’m totally off base. But, it just seemed like he was “fancying up” traditional recipes so that food critics would take Louisiana cooking seriously. So, first he modified the recipe, then I “unfancied” it. And it is really, really good and very true to the original. Excellent entertaining dish as well!! Heat olive oil and butter over medium heat in a large saute pan. Sprinkle 2 teaspoons of the poultry magic over the chicken pieces. Brown the chicken in the saute pan, about 2 minutes per side. Remove from the pan and set aside. Saute the onions and peppers in the remaining oil, until the onions are translucent. Add oil or butter if needed to prevent the veggies from burning. Add the remaining chicken magic, bay leaf , minced garlic, and cayenne pepper (if you want it really hot!) and cook for about a minute. Add 2 cups of tomato sauce and 2 cups of stock. 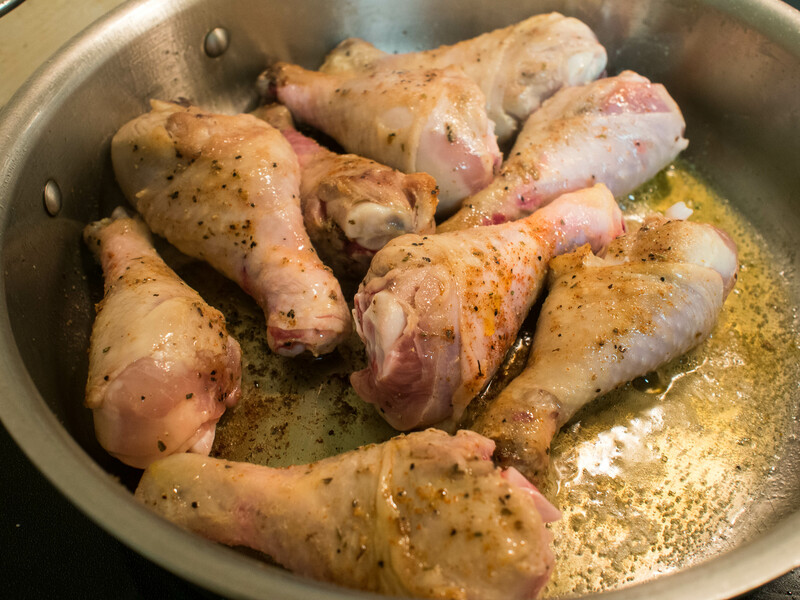 Return chicken to the pan and simmer for about 40 minutes, until the chicken is cooked through. Serve over cauliflower “rice”, rice or pasta. Top with the green onions and parsley. 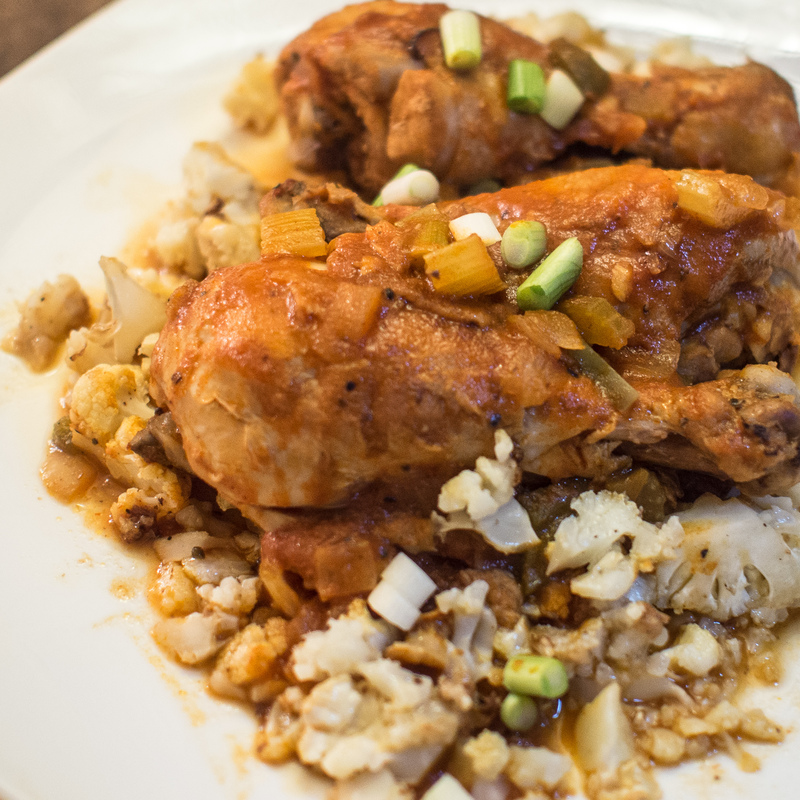 This entry was posted in Holiday Recipe, Low(er) Carb, Poultry and tagged Big Mamou, Chicken, easy, easy weeknight dinner, Mardi Gras, Paul Prudhomme on March 1, 2014 by dawn of food.